Q. ARE YOU GETTING THE SIGN BACK? Q. WHEN WILL IT BE UP? 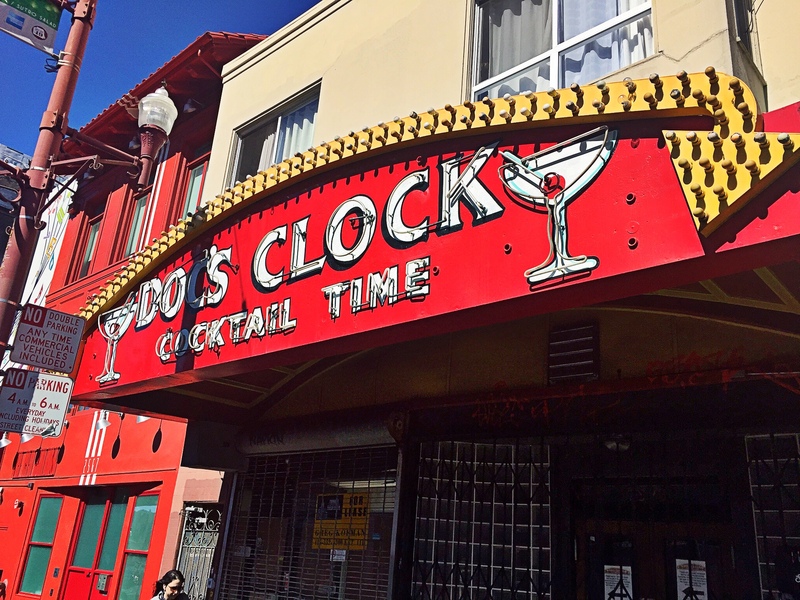 Bar owner Carey Suckow has faced ongoing challenges when it came to moving the neon sign to her new location at 2417 Mission St. after losing the lease at her previous space. Her former landlord fought to keep it, but after that beef was settled, a neighbor who's opposed to installing it at the new location led to additional delays. In February, supporters launched a GoFundMe campaign to raise $20,000. "We are finally moving our sign," said Suckow via email. "The community has been very wonderful and supportive and have helped us raise money to buy and move the sign," she said. 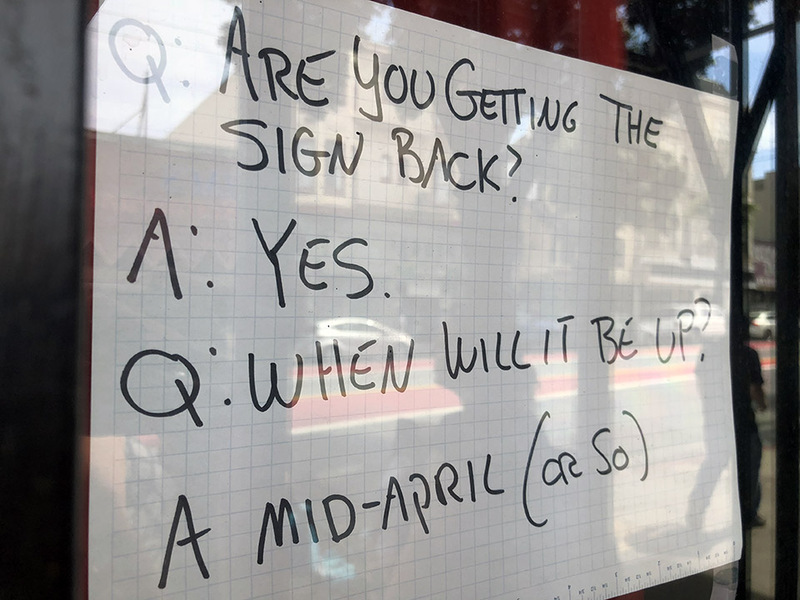 District 9 Supervisor Hillary Ronen also released a statement about her involvement in saving the sign earlier this year. According to the press release, Ronen said she worked with city agencies to give the sign "a special 'vintage' designation under the Planning Code" that allows the original sign to be removed and the building's owner to erect a replacement. City documents indicate that a permit for installing the electric sign was issued on March 22nd. 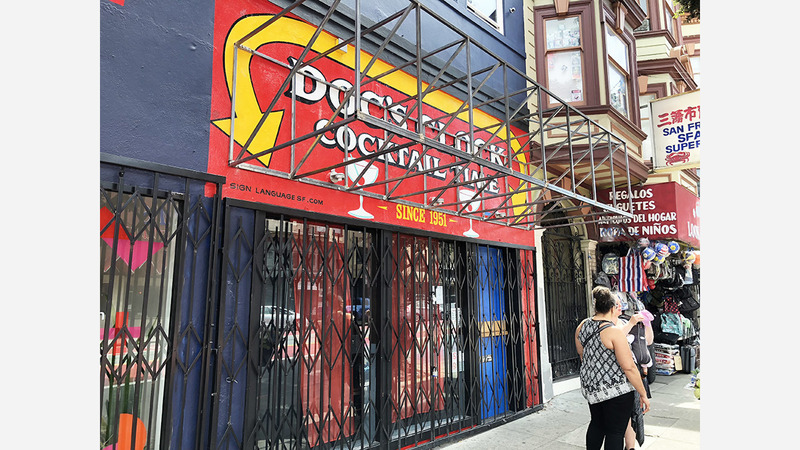 "I was able to bring together the bar owners, their previous landlords, and the Planning Department to figure out a creative way to allow the sign to be moved--which was a much more complicated process than one might think," Ronen said in the release. The GoFundMe campaign page states that Lucky 13, Ivy Room, Shambhala, Molotov's, Sycamore, Willows, Benders, Foreign Cinema, Alamo Drafthouse, Nick the Hairdresser and Elbo Room contributed to the fundraiser. "As long as good souls like this populate San Francisco, San Francisco will stay weird and beautiful and ours," Suckow wrote. The campaign raised over $8000, while Suckow said that an auction brought in more than $4000 and a fundraiser held by friends at Alamo Drafthouse brought in $1000. "I won't believe this is real until it is lit up over the new spot," she told Hoodline in February.